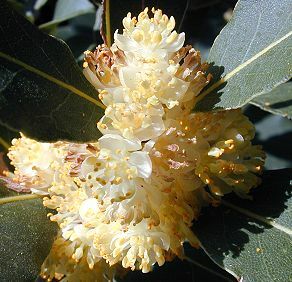 Bay Laurel, sweet bay or laurel tree, care and cultivation. Known as laurel by the Greeks who wore it as a garland round their heads. Also known as Bay laurel and Sweet bay. One of the most versatile herbs, Bay laurel can be grown as a tall evergreen tree with its glossy foliage or in containers often as standard. Hardy to around -7C. Another great advantage of a container bay laurel is that it can be a houseplant in the winter. The leaves are used in the French herb mixture 'bouquet garni' and it is often used to flavour stews and meat dishes. Want to buy a Bay Laurel? CLICK HERE to go and buy your Bay Laurel (UK only). Most positions although most vigorous in a sunny site, with lots of room for growth. Soil well drained, well-dug and composted before planting. The Bay laurel is a pyramid-shaped tree with aromatic, evergreen leaves and shiny gray bark. It can reach 60 ft (18.3 m) in height in its native conditions, but generally is much smaller, 3-10 ft (1 to 3 m) tall. The leaves are elliptic, 3-4 in (8 to 10 cm) long, thick and leathery, and shiny dark green. In Classical times the bay leaves were used to make the victor�s �crown of laurels�. Small, rather insignificant clusters of yellow, slightly fragrant flowers are produced in spring. In autumn, on the female plants, green berries appear that ripen to a dark purplish black. Several cultivars are commonly grown, including: 'Aurea', with yellowish young foliage; 'Angustifolia' (also called willow-leaf bay), with narrow lance-shaped leaves; and 'Undulata' with wavy leaf margins. Most important for Bay laurel is their position. Especially in cold areas it requires a position sheltered from harsh wind. 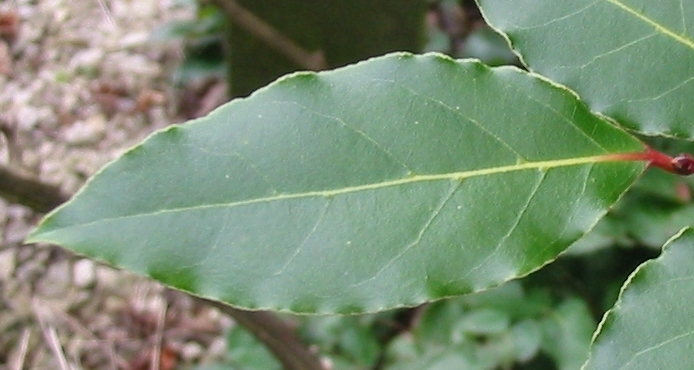 Whilst Bay laurel will grow in shade, it is best suited to a sunny position. It will will grow on most soil types as long as it is well-drained. If frost does cause all the leaves to turn brown (liable to happen at temperatures cooler than -6C), simply cut the plant down to about 15cm (6 in) above soil level. In spring, new shoots should then appear from the base of the plant. Young bay plants are at most risk of frost damage. Where growing bay in a container, it is often best to bring them indoors during the coldest three months of the year. A light, cool airy room is best. Don't water very much during winter, let the compost almost dry out before adding more water. Message: Hi There, I have a Bay Laurel hedge which looks beautiful from the outside, but the inside of it is being eaten away by snails. Do you know what I can use to stop this. Many Thanks, Bettie Martin.